If you’re like me, time seems to disappear much faster in the summer time. Not only is there more to do when you’re not holed up in your room, but this whole more-hours-of-sunlight thing just catches me off guard. One moment I’m frittering about at 6 in the sun and then next thing I know it’s 8:30 and the sun is still out. You’ve fooled me once again, mother nature. It just feels like you can do more when the weather is warm and the sun is shining and because of this things are busier and time flies faster. When this happens, it’s nice to have a quick meal recipe to fall back on. Asparagus season is in full gear right now which makes this recipe even more appealing (in season vegetables are just better). 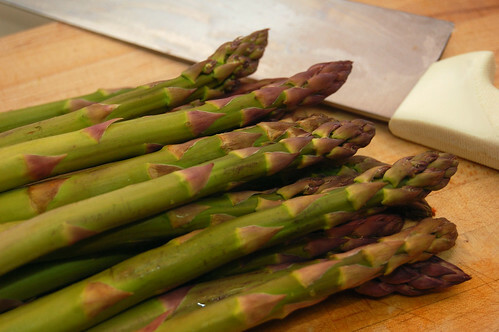 You can find asparagus in thick or thin stalks and I recommend the former for this recipe. The tomatoes “sauce” in this recipe doesn’t dominate your taste buds so the asparagus needs to step up. If you’re looking for a slightly more complex flavor, consider adding a teaspoon or two of pesto. Cook the pasta per the instructions; probably 11 minutes in salted water. While the pasta is boiling, cook the garlic and tomatoes in medium-low heat for 5 minutes. Add the asparagus and cover; cooking until the pasta is ready while stirring occasionally. 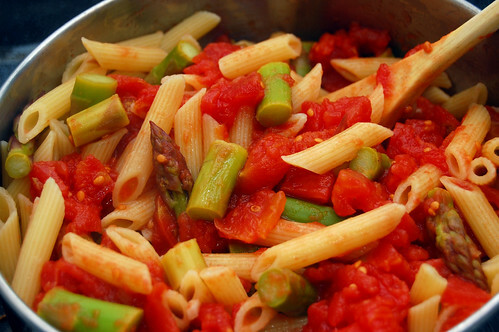 When the pasta is ready, add to your tomatoes and asparagus. Remove from the heat and toss. Serve and enjoy.